A few steps from the historical centre of Pienza, in the ancient farmhouse San Gregorio, seat of our farm, we offer hospitality in rooms and apartments with a beautiful garden, according to the experience got in Agriturismo Cretaiole property of the family.The position of the Agriturismo San Gregorio is rather particular as it is the nearest to Pienza, which can be reach on foot.The familiar context guaranties a genuine contact with the rural life of Val d'Orcia. This place was great. 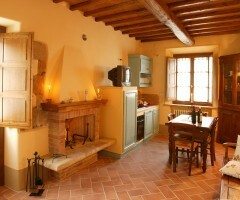 Spacious apartment with a kitchenette on a working farm. The owners are so friendly, the location perfect for walking into Pienza and visiting nearby hill towns, the apartment was spacious and clean and comfortable. L’OlivoCan accommodate two people. 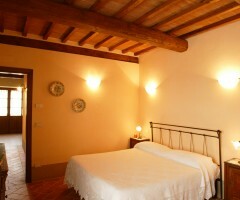 It is made up of a large room with a beautiful and big fireplace, a kitchen, a double room and a bathroom. La ViteIt 'a spacious and comfortable apartment that can accommodate four people and consists of a living room with sofa bed and bathroom, a kitchen with fireplace and a master bedroom with bathroom.